New aerodynamic 9455S propellers and new FOC ESC drivers offer improved noise control and sinusoidal current for increased stability. Aircraft noise has been reduced by up to 4dB* (60%) for quieter, more enjoyable flights. 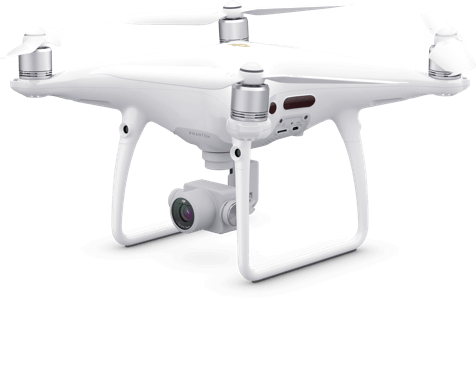 The Phantom 4 Pro V2.0 remote controller utilizes the OcuSync HD video transmission system that operates on both 2.4GHz and 5.8GHz frequency bands, with a max transmission range of 7 km. Assessing environmental conditions, the aircraft chooses the best band in which to operate, helping to reduce signal interference. OcuSync video transmission technology can sense environmental interference in real time. When the interference is strong, the system switches to the frequency point with the least amount of intrusion. With bi-directional perception and error-resilient technology, the Phantom 4 Pro V2.0 saves up to 30% of its bandwidth and solves common problems such as video lag and even compression artifacts within video transmission, providing crystal-clear live video at up to 1080p. OcuSync can connect to multiple devices at the same time. It can link two remote controllers* or a remote controller and set of DJI Goggles. OcuSync can sense aircraft altitude and the relative position of aircrafts while choosing the ideal antenna combination for Goggles, the remote controller, and aircraft for optimal signal transmission. * Linking of two remote controllers will be available in a future firmware update. The Phantom 4 Pro V2.0 wirelessly connects to DJI Goggles, putting you directly in the heart of the action with dual LTPS displays that offer a high-quality 1080p live camera view with an 85° FOV. Connected via OcuSync, users can experience fast and clear FPV flight with incredibly low latency.Plus, controlling your Phantom with DJI Goggles is more intuitive than ever. Just enable Head Tracking, which allows you to move the aircraft or gimbal simply by turning your head.